A balanced diet is essential. It provides your little one with vital vitamins and minerals required for his or her tiny body to grow, develop and function effectively – maintaining and repairing muscles, blood vessels, bones and internal organs. A diet lacking in the right balance can lead to growth and developmental problems. To help achieve a balanced diet for your baby, I’ve outlined some ‘must-know’ information below about food groups and vitamins and minerals. Don’t worry about how you can incorporate all of these vitamins and minerals into your little one’s diet. As well as creating yummy flavoursome recipes for my little one, it was essential ALL of my recipes were nutritionally balanced. All of these vitamins and minerals, and many more, make an appearance across a range of recipes on my website and in my books. Feel free to follow my recipes and meals plans, for a nutritionally balanced diet. If however, you want to make your own yummy creations, I would highly recommend adding aromatic herbs and spices to your little one’s meals. Achieving a balanced diet can be simple by boosting the taste of food groups with natural flavour-enhancers. 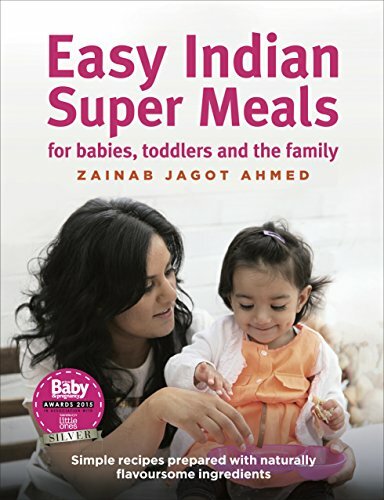 Tempting, flavour-filled meals means baby will be excited to try tasty new meals, developing a positive relationship with food. 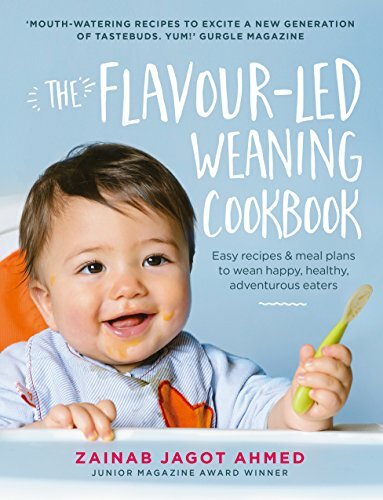 Read my article Add Flavour: 19 First Taste Herbs and Spices for Weaning Your Baby and follow my One Week Feeding Plan for safe introduction. A well-balanced diet can be achieved through eating a wide range of foods from five main food groups: Starchy Foods, Fruit and Vegetables, Dairy, Protein-rich Foods and Healthy Fats. All food groups have their own mix of vitamins and minerals. Found in tiny amounts they all play a big role in helping to ensure good health, growth and development. Bread, rice, potatoes, pasta, fortified breakfast cereals, rice, chapattis, pitta bread, couscous and plantains. Red and pink: cherries, red grapes, guava, papaya, raspberries, red peppers, strawberries, tomatoes, watermelon. Yellow and orange: apricots, cantaloupe melons, carrots, lemons, mangoes, oranges, peaches, pumpkins, squash, sweet potatoes. Green: asparagus, avocados, broccoli, cabbage, kale, lettuce, peas, spinach, watercress. Blue and purple: aubergine, beetroots, blackberries, blueberries, black grapes, plums, prunes, raisins, raspberries. White: apples, bananas, cauliflower, mushrooms, onions. Milk, cheese, yogurt, fromage frais and custard. Lean red meat, poultry, fish, eggs, nuts and pulses (e.g. beans, lentils and peas), and foods made from pulses (e.g. tofu and other soya products, hummus). Breastmilk, formula, oily fish (e.g. salmon, sardines), nuts and vegetable oils (e.g. rapeseed and olive). Vitamins are vital for your baby’s health, along with some other essential vitamins and minerals. Babies and children under five can risk running low on vitamins A, C and D. Formula contains all three vitamins and will keep levels topped up, if baby is having her 500ml a day. Breast-fed babies might need a vitamin D top-up in addition to their regular feed (from 1 month old). Ask your health professional for more information about vitamin drops. * Vitamin A: promotes healthy vision, healthy skin and maintains the immune system to protect against infections and viruses. Particularly useful for cold and flu season, if your little one will be attending nursery and play groups. Fruits and vegetables in the form of beta-carotene orange and yellow fruit and vegetables – (see above), spinach, red peppers. Very small amounts of beta-carotene can also be found in dried basil, dried parsley, dried oregano, ground sage and paprika. * Vitamin C: vital for little immune systems to help keep infections at bay. It helps protect cells from damage, is necessary for healthy connective tissue and encourages quick healing of cuts and grazes. In addition, vitamin C helps the body absorb iron from non-meat foods, which is extremely important for babies following a vegetarian diet. Found in: Strawberries, plums, raspberries, blueberries, watermelon, citrus fruits (i.e. oranges), kiwi fruit, mango, papaya, melon, red and green peppers, broccoli, Brussels sprouts, spinach, cabbage, cauliflower, white potatoes and tomatoes. * ‘Sunshine’ Vitamin D: Unlike other vitamins, vitamin D is produced by our bodies and we need sunlight on our skin for this to happen. Vitamin D regulates the amount of calcium in the body - necessary for keeping teeth and bones healthy. Strong bones are vital for helping your little one learn to walk. Found in: Oily fish (salmon, mackerel), eggs, liver, fortified breakfast cereals and fortified infant formula. You can also top up the whole family’s vitamin D by playing and spending time outdoors in the sunshine! * B Vitamins: necessary for converting food into energy, which your little one will need for crawling, walking and playing. It also helps the formation of healthy red blood cells. B vitamins include thiamin (vitamin B1), riboflavin (vitamin B2), niacin (vitamin B3), pantothenic acid (vitamin B5), pyroxidine (vitamin B6), biotin (vitamin B7), folic acid and cobalamin (vitamin B12). Each food group contains a different range of B vitamins. * Vitamin B12: necessary for the production of healthy red blood cells (with folic acid), nerve function and prevention of a type of anaemia. Found in: animal products – eggs, fish (sardines, salmon and tuna), red meat (lamb and beef), poultry, milk, yogurt, cheese and other dairy products. * Iron: essential mineral is required for the function of healthy red blood cells, which carry oxygen around the body. Your little one will have provisions of iron to last up to the age of 6 months. After this, your baby’s stocks will slowly begin to dwindle. But don’t panic. It only needs topping up while you wean your little one onto solid food. From then on she’ll get what she needs if she’s eating balanced, nutritious meals. So 6 months is a good time to start introducing iron into your little one’s diet. Found in: protein-rich foods – eggs, lean cuts of beef and lamb, dark chicken meat (legs and thighs), liver (once a week only), pulses such as lentils, chickpeas and kidney beans, nuts (peanut butter is good!). Dried fruit (apricots, figs and prunes), dark leafy green vegetables (spinach, watercress and kale) and fortified breakfast cereals are other valuable sources. It’s important to get iron into your little one’s diet, as a diet lacking in iron can lead to anaemia. Try to include an iron-rich food at least once a day when your baby is enjoying solid food. * Calcium: required for building strong teeth and bones, regulating muscle contractions in the body (including heartbeat), and ensures the nerve function works effectively. It’s important to note that whole milk MUST NOT be introduced into a baby’s diet as a main drink prior to the age of one. However, cow’s milk is suitable to use in cooking from 6 months. Read my article 12 Harmful Foods and Ingredients to Avoid When Weaning Baby.